I am what you call a “saint-aholic.” I love meeting new saints, reading saint biographies, and asking saints for help. I have to admit that when I first started to think about writing about meditation as a form of prayer I was definitely skeptical. Fasting and almsgiving are two pillars of Christian prayer. We normally only hear about them during Lent, when we are called to fast and give alms as part of our Lenten journey. When thinking about prayer, spiritual reading isn’t the first thing that normally comes to mind. Growing up Catholic, I never read the Bible except at Mass. I remember the first time I prayed the Divine Office, or the Liturgy of the Hours. What can be said about Jesus' Passion that hasn't be said, analyzed, studied and thought? For starters, Praying Our Lives is not really a book club read as it is a compilation of hundreds of prayers, oldies and new ones, for any and every moment in a woman's life, including mass, eucharistic adoration, motherhood, love, and creation. My own mother gifted this book to me as assistance through a terribly difficult time in my life. The text includes prayers written by saints, ancient celtic prayers, even Bible studies and reflections. The book is such a personal journey and I've only included a few prayers for you to read, but it is so worth getting a copy for yourself. I wish I could personally bless each of you with a copy, almost like HoM's Favorite Things...alas, I trust Mama Mary to find a way to get it to you. The Lord bless you and keep you; The Lord make his face to shine upon you, and be gracious to you; The Lord lift up his countenace upon you, and give you peace. Let nothing disturb you, nothing affright you; all things are passing, God never changes. Patience attains all thats it strives for; one who possesses God finds nothing lacing: God alone suffices. Seek the Lord, who longs to be found. Call upon your God who is very near. I would love to be able to say that I have always been close to Mary and have always found comfort in the arms of our Mother, but that has not always been the case. Ask any of my family members and they will tell you that I’ve always been what you call a talker. Novenas are something that I have recently come to discover as a form of prayer and have really started to love. I still remember the first time I was in Adoration. 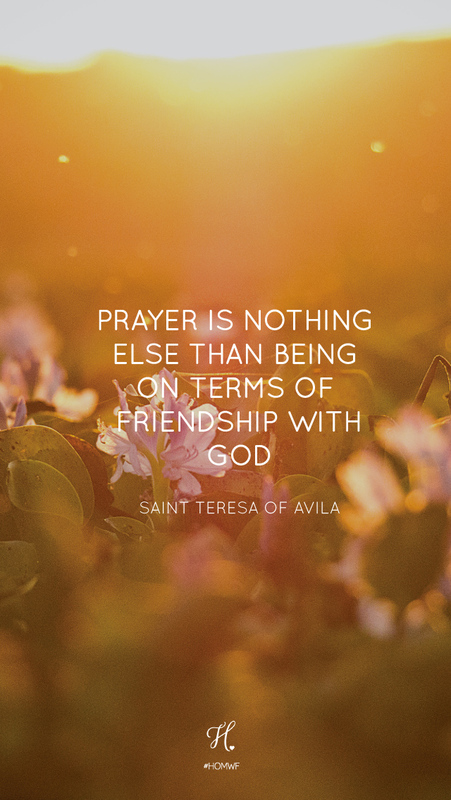 Growing up I knew of two kinds of prayer: quietly praying whatever I was thinking in my head, and group prayer where everyone held hands, we closed our eyes, and one person at a time saying a blessing.